Looking for something to keep your mind off of this cold, snowy winter? 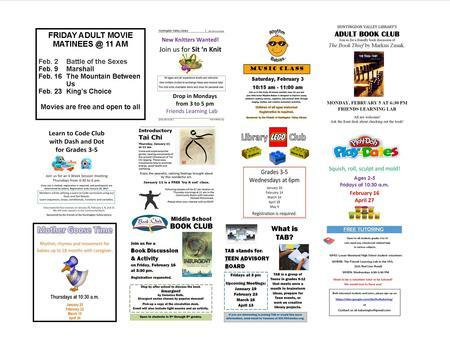 Join us for a movie, knitting, a book club, Tai Chi, or one of our great Teen or Children’s events! Here are some highlights from the February Calendar! Storytimes on Monday and Tuesday mornings, Sit ‘N Knit on Monday afternoons, and Friday Movies, plus Representative Murt is here on the Thursday, Feb. 15 at 10 am for constituent visits. Learn to Code Club Winter Session, Thursdays at 4:30 pm. Tai Chi on Thursday mornings at 11:00 am – drop in, only $7 and Library Yoga on Wednesday mornings at 10:30 am. Adult Book Club! on Monday, February 5 at 6:30 pm. Join Meg and company in a discussion of Markus Zusak’s The Book Thief. Valentine Drop in Craft, Tuesday, Feb. 5 at 3 pm. SAT Practice Exam on Sunday, Feb. 11 at 1 pm, only $50! Library LEGO Club on Wed., Feb. 14 at 6 pm for grades 3 to 5. Friends Book Club on Thursday, Feb. 15 at 12:30 pm, discussing The Residence: Inside the Private World of the White House by Kate Andersen Brower. 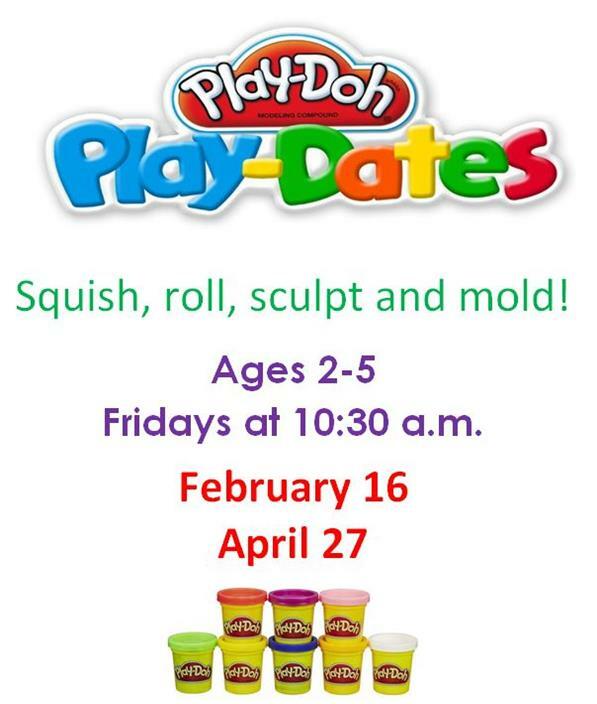 NEW Play Doh Playdate Squish, roll, sculpt, and mold! for ages 2 to 5 on Friday, Feb. 16 at 10:30 am. Middle School Book Club – Friday, Feb. 16 at 3:30 pm (by group consensus) discussing Insurgent by Veronica Roth. Library LEGO Club on Monday, Feb. 19 at 4:15 pm for grades K to 2. Mother Goose Time – new date Thursday, Feb. 22 at 10:30 am for babies up to 18 months with caregiver. Saturday Storytime on Saturday, Feb. 24 at 11 am with Miss Meg. Teen Advisory Board meets Friday, Feb. 23 at 3 pm with Vanessa.